Women fall in love with a man because of his character. Women also stay in love because of the man’s character. As men, our character should not change simply because we are now officially “in a relationship.” The truth is, you can lose the woman by doing so…quickly. It is our duty, as men, to be upright and honest in everything that we do. Not just in a relationship, but outside of it. It goes without saying that your woman deserves a man with such traits of honesty and goodwill. 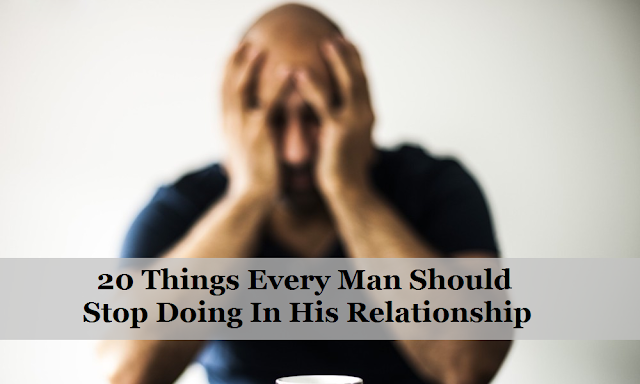 This article discusses 20 things a man should stop doing in a relationship. This notion assumes that you still indeed love the woman. Bearing this in mind, it is important to cease character-damaging behavior before it’s too late. 1. DON’T STOP GETTING TO KNOW YOUR PARTNER. Just because you’re together don’t mean that inquisitiveness stops. Don’t become too complacent by thinking you know everything about her. 2. DON’T UNDERESTIMATE THE IMPORTANCE OF YOUR PARTNER’S WORK. Whether your partner is a stay-at-home mom or a full-time office worker, don’t neglect to recognize their hard work. 3. DON’T GO STRAIGHT FOR THE COUCH AFTER GETTING HOME. This is such a common behavior for us men! We have a long day and can’t wait to flop onto the soft cushions of our couch. If she’s home, give her a kiss and ask about her day. 4. DON’T PUT WORK BEFORE YOUR PARTNER. Many men take it upon themselves to provide the best possible life for their partner. While this is admirable, don’t allow your work to distract you from what’s truly important. 5. DON’T PRETEND TO BE LISTENING WHEN YOU’RE NOT. “Uh…uh-huh…sounds good.” Meanwhile, you didn’t listen to a word that she said. Maintain eye contact, engage in conversation, and show her that you’re really good listener. 6. DON’T BECOME A CLOSED BOOK. When life gets difficult, it’s so easy for us to just shut down. But us men have to remember that someone is depending on us to be physically and mentally present. 7. DON’T CRITIQUE OR CRITICIZE YOUR WOMAN IN FRONT OF OTHERS. When there’s tension between you and her, it’s important to remain calm and collected. Don’t allow yourself to say something, especially in front of others, that you may come to regret. Breaking up is serious, and divorce even more so. These words should never be muttered in haste. Doing so can even end a salvageable relationship. 9. DON’T PROCRASTINATE WITH YOUR HOUSEHOLD DUTIES. If it’s your responsibility to take out the garbage after dinner, do it. If you said you’d clean the garage this weekend, do it. Be a responsible man around the house. 10. DON’T FORGET TO COMMUNICATE YOUR WHEREABOUTS. Communication is the backbone of any relationship. When a man doesn’t clue his woman in on where he’s going or what he’s doing, it’s incredibly disrespectful. 11. DON’T PURCHASE ANYTHING MAJOR WITHOUT FIRST DISCUSSING IT. Oh, you want that new TV? Is that new suit catching your eye? That’s cool. What isn’t cool is purchasing something costly without first discussing it with your lady. 12. DON’T HONE IN ON OTHER WOMEN FOR TOO LONG! Beautiful women are almost irresistibly eye-catching. A first look – even a short “trail” – is natural. However, it’s probably best to check your woman-watching in front of your woman. 13. DON’T FORCE HER TO MAKE ALL THE IMPORTANT DECISIONS. Not all decisions can be made together, for whatever reason. However, when it comes to something significant (e.g. your kids, the house), you must be willing to expend some brainpower and help with the decision. 14. DON’T REACT IMPULSIVELY WHILE ARGUING. This one spells (unavoidable) danger. When our temper rises, we have a tendency to allow our brain to check out. This can lead to hurtful words being uttered without thinking. Allow yourself to cool down. 15. DON’T TAKE ADVANTAGE OF HER KINDNESS. One reason you probably fell in love with your woman is her sweet nature. Women can be very caring and generous; but this doesn’t give you the right to take advantage. Reciprocate kindness, as well. 16. DON’T FORGET TO PLAN AN EVENING OUT, ON OCCASION. Gosh, it just seems that we’re so busy all the time. When we’re home, it can be so tempting to want to just “Netflix and chill.” This is cool most of the time, but don’t forget to add novelty by taking her out on the town on occasion. 17. DON’T EXPECT HER TO TEND TO YOUR EVERY NEED. Somewhat related to #15, it is important to not anticipate her meeting your every need. As men, we must take it upon ourselves to be responsible. This means caring for ourselves, in many ways, like we did before we met her. 18. DON’T ACCUSE HER OF ANYTHING WITHOUT EVIDENCE. This one is another potential backbreaker. Accusations, especially of the serious kind (e.g. cheating) can irreparably damage a relationship. Make sure you have clear evidence of the offense. 19. DON’T INSULT HER MALE FRIENDS. Odds are she probably has a male friend of acquaintance that may rub you the wrong way. You can verbalize these concerns without insulting her social circle. 20. DON’T ATTEMPT TO CONTROL HER. As partners, you should both understand that time apart is both healthy and necessary. When she tries to have a night to herself, let her without becoming a master.